If you are a complete novice at hydroponic gardening, I think you might be a bit overwhelmed and confused about gardening gear like ventilation systems, nutrients, hydroponic lights, reservoirs, grow trays and so on. I am quite sure that when you do research into basic gardening items for a successful operation, you will see that there are hundreds of products available on the market ranging from a low to high price. Thus, to help reduce your stress pressure, today’s article will give you a basic buying guide as well as full reviews of the best hydroponic system 2019. I hope that after reading this, you could be confident to make a right purchase. In simple words, a hydroponic system is a system that will help you grow your plants in water, instead of soil as usual. To grow them, you just use mineral solutions, which surround the plant roots. Additionally, an inert medium is sometimes be utilized to support the roots. So now, we are moving to the next part in which I am going to show you the bare essentials that need to be taken into account before you reach a decision. 1. What type of hydroponic system is most suitable for you? There are 6 different types of hydroponic systems in the market right now, and each of them has distinctive features. If you want to raise your plants in a dry condition, you can go for Ebb and Flow products. However, if you are a complete novice in this field, a Deep Water Culture might be a good choice because it is user-friendly and does not require regular maintenance. 2. Does it fit your space? More and more people choose a hydroponic system for their urban garden which means that you can grow your vegetables and flowers inside your house, on the rooftop, or on the patio without taking up too much space. Although most hydroponic systems use a small space, there are a wide range of sizes available. You need to check the design carefully to make sure that it will fit your space well. The bucket sizes are measured in gallons. The more gallons the system provides, the more space your plants will have to develop their roots, and will therefore always have access to the nutrients. 4. How many growing sites will you need? Normally, a hydroponic system will allow you to grow at least 4 different kinds of plants at the same time with 4 growing sites. Thus, depending on the number of plants you want to raise, check how many growing sites that particular system offers you. 5. Can it be expanded? One of the best hydroponic system’s features is that it can be adjusted if your garden needs expanding. Please check with the manufacturer or the salesman about the expandability of your system. 6. How much can you afford? Your best hydroponic system should satisfy your particular requirements for gardening as well as keep within your budget. It will be good if you can purchase a system equipped with advanced technology. The more functions it has, the more you’ll have to pay. Therefore, think about your needs carefully and set your budget. Ask yourself if you really need a professional system or not, especially if you are not a commercial gardener. What follows is the most important part of today’s post. As I promised, here are full reviews of top 5 best hydroponic systems in the market. The first product in the top best hydroponic system group is from PowerGrow. 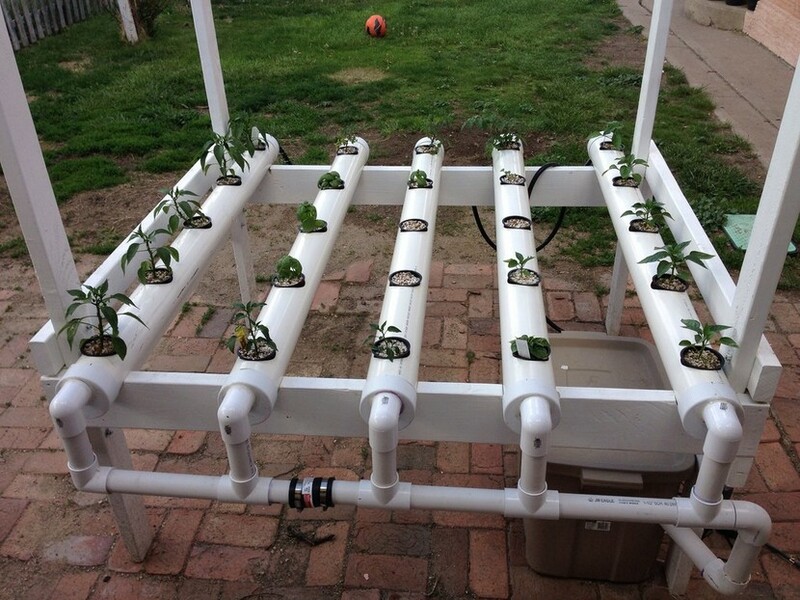 This system from PowerGrow is really user-friendly and does not require use a lot of effort and time. 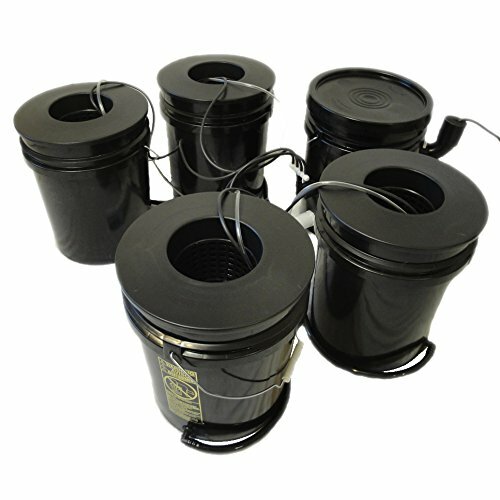 In the kit, the manufacturer provides you with four 5-gallon buckets allowing you to grow 4 different types of plants. The deep space of each bucket allows the roots to develop completely in water with a spacious area. Hence, your plants can easily draw nutrients into the reservoir in order to build healthier roots. The system does not take up too much space, making it suitable for small gardens. Thanks to the 5-gallon buckets, your hydroponic garden will remain tidy and will not require too much maintenance. 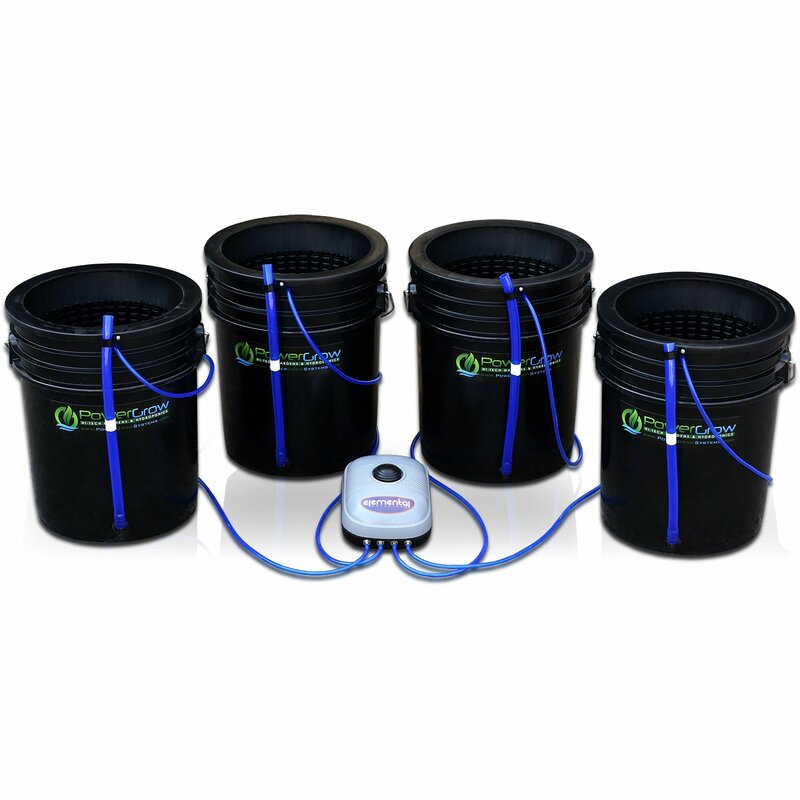 Each bucket is equipped with a drain and water indicator, so you will not need to worry about whether your plants are receiving enough water or not and the water changes will be much easier. Moreover, the buckets from PowerGrow are certified by FDA, so they are not harmful to either you or your plants. The next system is also from the brand PowerGrow. In fact, this is just a smaller version of the previous product. The reason I say ‘a smaller version’ is that the biggest difference between them is that this kit will bring you 6-inch buckets while the first one reviewed offers 10-inch buckets. This system from PowerGrow is really easy to set up and does not require a lot of effort and time. Inside the box, you will receive four 5-gallon buckets allowing you to grow 4 different types of plants. You also get basket lids, air stones, airlines and air pump. The deep space of each bucket will provide strong support for the roots to developing completely in the water. Your plants will easily be able to draw nutrients into the reservoir in order to build healthier roots. The system does not take up too much space, making it suitable for small gardens. Thanks to the 5-gallon buckets, your hydroponic garden will remain tidy and will not require a lot of maintenance. 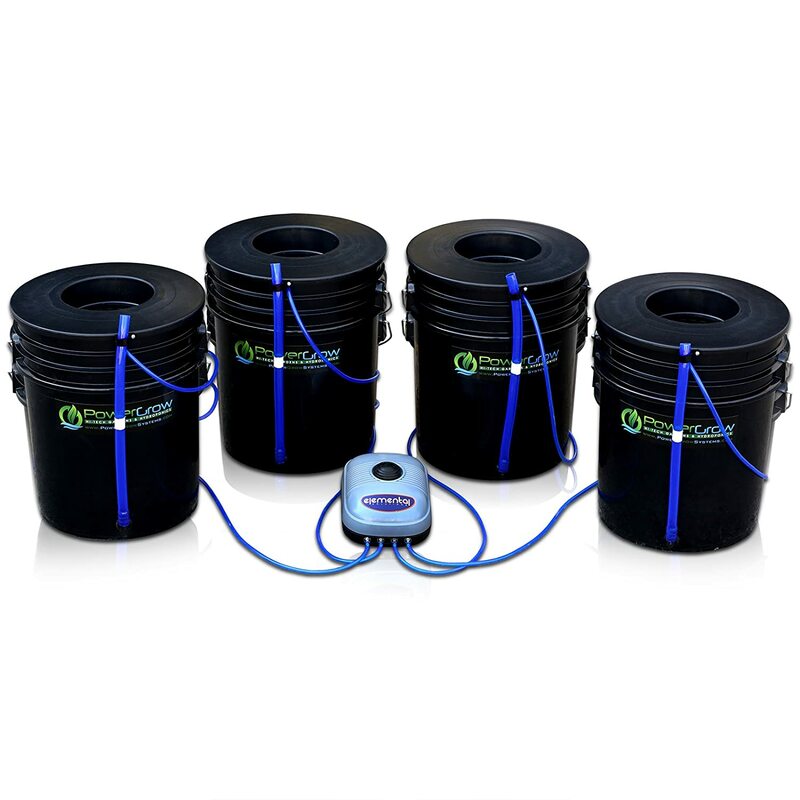 In addition, each bucket is equipped with a drain and a water indicator, so you will not need to worry about whether your plants are receiving enough water or not. The water changes are a lot easier too. Let’s move to the next product which is also considered as one of the best hydroponic systems on the market. The hydroponic system from HTG Supply will provide you with 6 growing sites. You will therefore have more opportunities to plant more flowers or vegetables in comparison with the 2 systems above. Although they are just 3.5-gallon buckets, your roots still have enough space to grow as well as get instant access to nutrients to help your plants grow quickly. Apart from the 6 growing sites, the kit includes six lids, one electric air pump, six 2-inch air stones and one air tube. Additionally, the HTG Supply DWC System – 6 sites will give you ten-liter bags that contain premium clay pebbles as your growing medium. This might be the reason why it shows up in top 5 best hydroponic system reviews. You find it very easy to assemble the system thanks to the clear and detailed instructions. The design is neat and convenient to use, which is suitable for those with limited space. Otherwise, this product does not need regular maintenance. Similar to the other hydroponic systems from GrowPower, this does not require the use of a lot of effort and time. 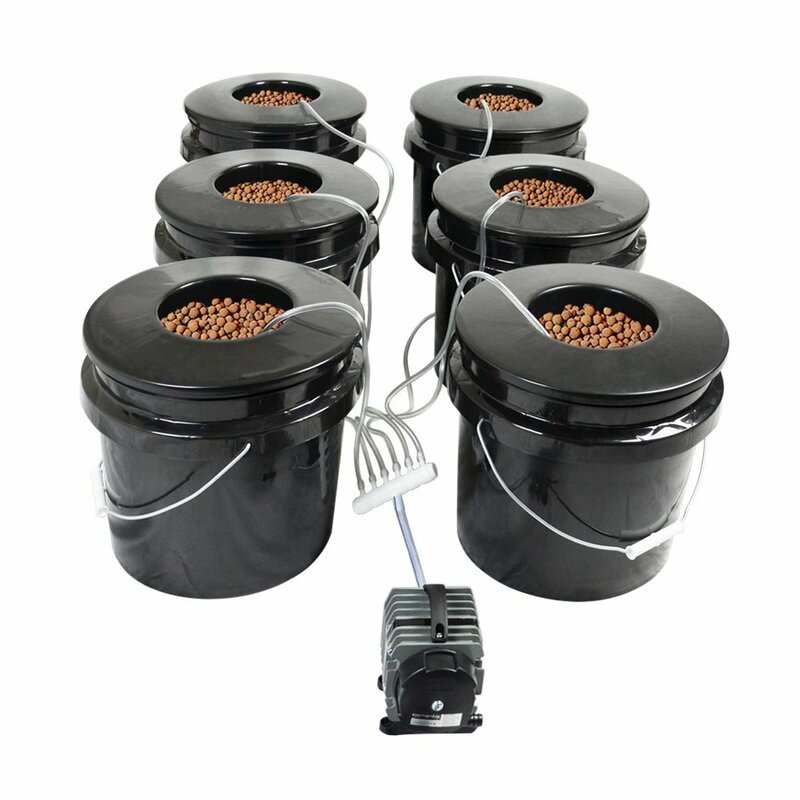 In the kit, the manufacturer provides you with eight 5-gallon buckets allowing you to grow 8 different types of plants. The deep space of each bucket helps the roots develop completely in water with a spacious area. Hence, your plants can easily take nutrients into the reservoir in order to build healthier roots. The system does not take up too much space which is suitable for small gardens. Thanks to the 5-gallon buckets, your hydroponic garden will remain tidy and will not require a lot of maintenance. 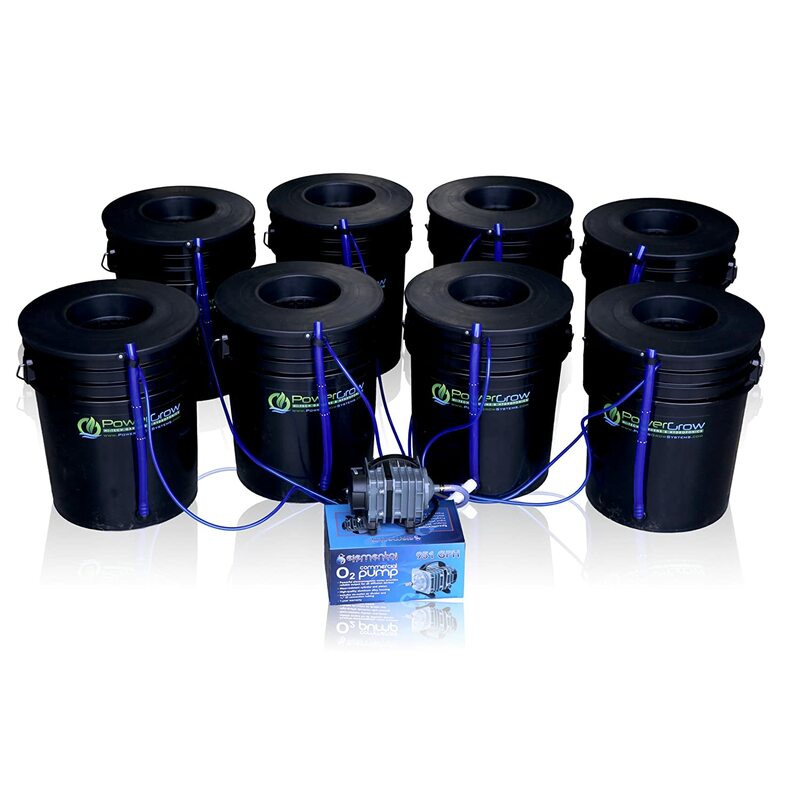 Likewise, each bucket is equipped with a drain and water indicator, so you will not need to worry about whether your plants are getting enough water or not and the water changes will be fairly simple. The manufacturer also provides consumers with air stones which will help your plants avoid low oxygen levels. Moreover, the buckets from PowerGrow are certified by FDA, so they are safe for both you and your plants. The next system is also last one in the best hydroponic system reviews today, and is from AquaBuckets. Applying modern technology – Deep Water Culture, AquaBuckets DWC Hydroponic System allows your plants draw nutrients 24 hours per day. Moreover, their Superior Cell Tethered technology help you move the cell with ease even if your flowers or vegetables are in the middle of their growing cycle. They have improved the footprint and wattage with this system too. In addition, this system is compatible with different sizes of growing spaces, from a limited size to a large garden. Furthermore, the PH level will be stabilized, and the water will constantly be recirculated to make sure your plants will develop in a good combination of nutrients. The manufacturer provides you with 4 growing sites so that you can try 4 different kinds of plants at the same time. This is the last one in the list of the best hydroponic system products today. I hope that you have found it useful. 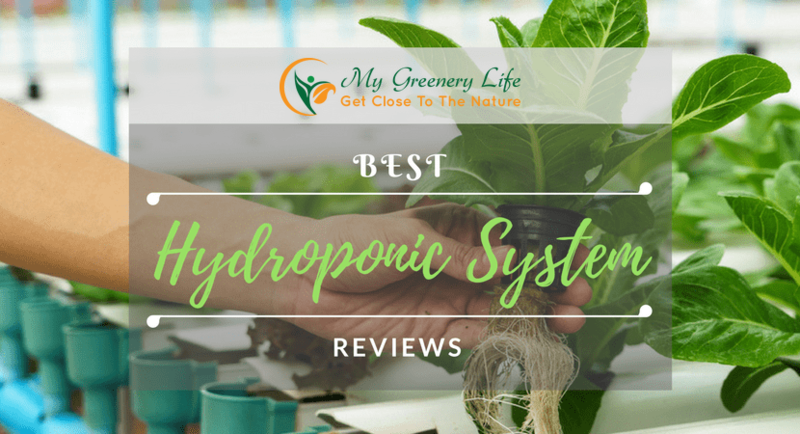 We have just walked through the basic buying guide to buy a good hydroponic system and the full reviews of the best hydroponic system on the market 2019. So, hopefully choosing a best hydroponic system does not seem so daunting anymore. I hope this article has been useful for you. If you have any questions, please leave a comment below. Thank you so much for reading!